CANTON, Mass., 2017-Dec-06 — /EPR Retail News/ — Baskin-Robbins, the world’s largest chain of ice cream specialty shops, today (December 4, 2017) announced a festive lineup of treats to help guests celebrate the holiday season. Baskin-Robbins is kicking off its holiday lineup with the debut of its new Winter Wonderland Cake, which is an ice cream cake decorated with elegant blue icing, a white dipping chocolate drizzled edge and is topped with sparkling glitter. Additionally, the December Flavor of the Month, YORK® Peppermint Pattie, is a returning favorite which features mini YORK® peppermint patties and a rich dark chocolate mint-flavored ribbon swirled in mint-flavored ice cream. Guests can enjoy YORK® Peppermint Pattie as a Warm Brownie Sundae during a cold winter night or sip it in a Milkshake or Cappuccino Blast® to keep the season bright. 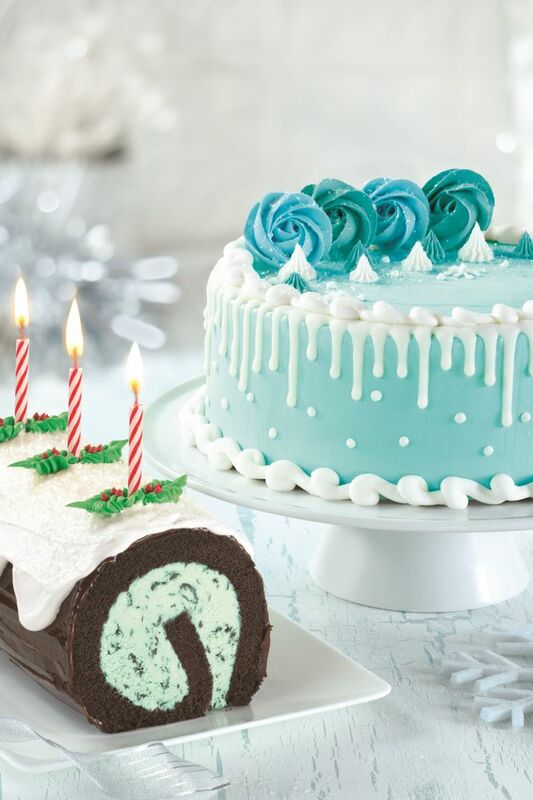 To help spread even more holiday cheer, Baskin-Robbins will also offer guests its Fudge Yule Log Cake, which features Mint Chocolate Chip ice cream and chocolate cake rolled together with white icing, then topped with a holly leaf decoration and three red candles. The Fudge Yule Log Cake and the Winter Wonderland Cake are available for pre-order both in-store or online at www.baskinrobbins.com/onlineordering. Baskin-Robbins is also inviting guests to celebrate the end of the year in the sweetest way with its “Celebrate 31” promotion on Sunday, December 31. On this day, all regular and kid-sized scoops will be $1.50*. Finally, for guests looking to give the gift of ice cream this holiday season, Baskin-Robbins gift cards can be purchased in-store or through the Baskin-Robbins mobile app. The YORK® trademark and trade dress are used under license. * Offer valid on October 31st. Participation may vary. Scoop offer good on every size scoop. All listed flavors are optional amongst Baskin-Robbins’ stores. Waffle cones and toppings are extra. Cannot be combined with other offers. Plus applicable tax. Named a top ice cream and frozen dessert franchise in the United States by Entrepreneur magazine’s 38th annual Franchise 500® ranking in 2017, Baskin-Robbins is the world’s largest chain of ice cream specialty shops. Baskin-Robbins creates and markets innovative, premium hard scoop ice cream, a full range of beverages, and a delicious lineup of desserts including custom ice cream cakes, the Polar Pizza® Ice Cream Treat and take-home ice cream quarts and pints, providing quality and value to consumers at more than 7,900 retail shops in 52 countries worldwide. Baskin-Robbins was founded in 1945 by two ice cream enthusiasts whose passion led to the creation of more than 1,300 ice cream flavors and a wide variety of delicious treats. Headquartered in Canton, Mass., Baskin-Robbins is part of the Dunkin’ Brands Group, Inc. (Nasdaq: DNKN) family of companies. For more information, visit https://www.baskinrobbins.com/. This entry was posted in Business, Food & Beverage, Management, Retail, Retailer and tagged Baskin-Robbins, December Flavor of the Month, holiday season, Katy Latimer, Winter Wonderland Cake, YORK Peppermint Pattie. Bookmark the permalink.